We’re excited to announce an official release date for the hotly-anticipated conclusion to the bestselling Dragonprince Trilogy! We plan to release Aaron Pogue’s next title, The Dragonprince’s Heir, on Tuesday, June 26th, along with the debut epic fantasy Rethana’s Surrender by Courtney Cantrell. And in case you’re having a hard time waiting, Aaron has shared some friendly recommendations for passing the time until June 26th. Cow Boy is a tremendous read that I’m having a hard time pinning down. Not my feelings about it, mind you. I loved it. But the book itself is…complex. Yeah, that’s a perfect word. It’s complex, so I can’t boil it down to a one- or two-sentence high concept. That’s probably the main reason I liked it so much. So the easy stuff first, those so-called “facts” that don’t need to know how I feel about them in order to be important. Cow Boy vol. 1: Justice Ain’t Got No Age is written by Nate Cosby (Pigs, Jim Henson’s The Storyteller) and Eisner and Harvey Award nominee Chris Eliopoulos (Franklin Richards, Pet Avengers). It also will feature several short stories from Roger Langridge, David Gallaher & Steve Ellis, Brian Clevinger & Scott Wegener, Colleen Coover, Paul Tobin, and others. The publisher is Archaia, which means it will be a gorgeous, full color hardcover available in bookstores that know what’s good. So, that’s done. Here’s why the thing is a complex piece. It’s an all-ages book. I follow Nate Cosby on Twitter and he’s often talked about his commitment to and belief in the importance of all-ages material. I share this belief, and not just because I have children. I share it because there are children in the world. I’m a prime example of somebody who developed a love for reading, literature, mythology, and high adventure because of (superhero) comics and I lament deeply that this isn’t really something that can happen with (superhero) comics for my kids. Or at least, certainly not in the bulk of them as it did for me. Enter every other kind of comics. Especially this one. Cow Boy is a Western. This isn’t just because that’s a good backdrop. It’s a Western in that the patois is decidedly Western, the archetypes Cosby and Eliopoulos are playing with are decidedly Western, and it’s a premise that works within the genre conventions of a Western and may not work in too many other genres. 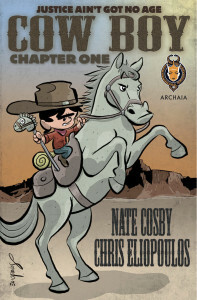 The tale follows 10-year-old Boyd Linney as he rides across the West determined to bounty hunt his entire, worthless, double dealin’, no good, outlaw kin. All of them. And there’s apparently a lot of them. And he starts with his daddy. That’s pretty heady stuff for an all-ages book. Betrayal, familial neglect, gunplay, tough-talkin’, and bounty huntin’ (not to mention a crushing disappointment for Boyd from a corner you do not expect) are all tough concepts to talk to kids about. But that’s why this complex book works so well. Eliopoulos’s art is very well done and wonderfully cartoony. I’ve enjoyed his work in broad, slapstick books before. But in Cow Boy, it’s cartoony to show just how angry Boyd can get, to show just how mean bigotted townspeople can get, or to show how dismaying it can be to know you’re utterly alone in the world at the tender age of ten. There is some violence, but most of it amounts to less than you’d get from a roadrunner and a coyote. There is some tough talk, but nothing you wouldn’t want your elementary schooler repeating. Mostly, you get very difficult, very emotionally charged topics presented in a way that gives you an opportunity to discuss them with your kids and maybe, just maybe get ahead of some of their own emotional development. That’s pretty intense. And it’s also pretty great. All of that is wrapped up in a tremendously entertaining story with a lot of very clever writing, both in the plot and in Boyd’s own turn of phrase. They’re then bookended with short stories of only a few pages from some of the more colorful, inventive, and funny people in comics. Though quick and not always packing the same punch as Boyd’s tale, these shorts are a welcome addition to the book. I recommend Cow Boy to parents, to aunts and uncles, to teachers, to Western fans, and to anyone who thinks smart, emotionally charged, all-ages fiction is worthwhile and important. Look for it in April 2012 in fine bookstores everywhere. For reasons only tangentially related to this post, I have decided to read several recent and semi-recent Marvel Comics collections to see how they stack up in terms of overall quality and as Young Adult fiction. The most ambitious of these reading experiments was the first volume of the Captain America Omnibus. It is 744 pages of flag-themed-spandex-wearing super espionage. It took me days and days to read it. I stayed up late and got up early to do it when nobody was around to take my attention from it. It was worth every minute. There are a boatload of people responsible for this book since it collects nearly thirty individually published comic books, but I’m going to simplify it down to the names on the spine. Ed Brubaker is the writer. He’s well known for indie crime books and for runs on Batman and Catwoman, as well as co-creating the police drama Gotham Central with Greg Rucka. The two artists mentioned are Steve Epting, of El Cazador fame, as well as Mike Perkins, best known for, well, this Captain America stuff honestly. But his style is a healthy dose of pulp in the Mignola/Hellboy school that fits the flashbacks to the War very well and works as a counterpoint to Epting’s more realistic style. This is a superhero story by way of espionage, but in a way that makes James Bond look like he’s living a life of humdrum boredom. For those of you who haven’t seen the movie and have never read a comic book with Captain America in it, I’ll give you the quick rundown. Skinny, unhealthy Steve Rogers attempted to join the army to fight Nazis but the recruiters rejected him as unfit. A general saw the strong heart and courage housed in his weedy frame and recruited him for Project: Rebirth, an attempt to create American supersoldiers. A Nazi agent murdered the scientist responsible for the project moments after Rogers was exposed to the formula. The scientist died and his research was destroyed in the ensuing fire, leaving Rogers the only supersoldier America would ever have. Now the peak of all human physicality, they garbed Rogers in a flag-inspired uniform, gave him an indestructible shield, and sent him into the various WWII theaters as Captain America. Joining him was a younger man, James “Bucky” Barnes, who fought alongside him, responsible for all the dirty things war requires but you don’t want to see Captain America do on the newsreels. Their final mission in the war left Bucky and Cap presumed dead, though Cap was frozen at the north pole and discovered decades later by the Avengers. Now a man out of time, he joined the Avengers and continues to fight the good fight as Captain America. In addition to his more overt work with the Avengers, Captain America works with SHIELD, the worldwide peacekeeping and espionage agency of the Marvel Universe. This volume concentrates much more on the espionage end of the spectrum. Cap; SHIELD Director Nick Fury; Cap’s liaison and love interest, Agent 13; his greatest enemy, the Red Skull; a Russian businessman with reasons to hate most of the above; the Skull’s chief henchman, Crossbones, and his daughter, Sin, who are like the superspy versions of Bonnie and Clyde – all these players and more factor into the epic-in-scope tale Brubaker has crafted around America’s supersoldier. If it sounds like a soap opera starring people who wear loud costumes and might be spies, that’s because that’s exactly what it is. It’s like the nighttime television version of a Marvel comic, only with a blockbuster movie budget since ink is relatively cheap. What’s more, Brubaker crafts some true twists and turns that caught many a jaded comic book fan by surprise. I can’t really go into them without giving away the best bits of the plot, but needless to say, Bru convinced a lot of rabid fanboys to accept a status quo change that had the potential of being mightily unpopular. All at the same time, he puts together an emotional, relationship-fueled story with the backdrop of ex-Nazis leading modern terrorist groups with reality warping crystal cubes versus black-jumpsuited superspies who hang out with a living legend of WWII. Epting, Perkins, and the rest of the artists all do a fantastic job, although the former two are the real stars. Epting is a master of page layout, fight choreography, and emotional storytelling via facial expression and body language. Perkins, as mentioned, brings a pseudo-retro style to the flashbacks set in World War II that sets counterpoint to the modern story going on even as it illuminates it. And because this was on my mind, this is totally appropriate for a YA audience. There are suggested sexual relationships as well as the usual violence you’d expect in a grittier superhero book, but it’s all handled very PG-13. There may be some outliers, but I think most parents would feel it appropriate to read along with their teens. And therein lies the rub, because this book is filled with teaching opportunities. World War II, the Cold War, the modern War on Terror are all conversations that could be spawned from this adventure story. The philosophy of Just Wars, Fascism, Nazism, Communism, or even the plethora of moral gray areas brought on by espionage itself are also represented. If you buy the series Civil War and read it alongside this book, there is even the opportunity to discuss the current dilemma of freedom versus security. Parents, don’t miss the is opportunity to use a pulp adventure story with sci-fi elements to get your kids interested in American history. All in all, I’m going to read the next two or three volumes of Brubaker’s Captain America even though all of them are nearly as humongous as this one. With my ridiculous reading list, that’s probably the most powerful recommendation I can give it. I thought I was going to have to give in and review a book without pictures by one of my favorite comic book writers. But instead, Twitter provided and I get to take an early look at Pigs. Thank you, Twitter. Pigs is an espionage thriller written by Nate Cosby and Ben McCool, drawn by Breno Tamura, with colors by Christopher Sotomayor. Rus Wooten handles the letters and production. As an added bonus, it has a beautiful and suggestive cover by Jock. So, I’m familiar with Cosby and McCool but not closely. Honestly, thanks to Twitter, I’m probably more in touch with Cosby as a human rather than a writer. I know he loves hip hop (I one-sided bonded with him over that) and is putting together a Jim Henson’s Storyteller comic I can’t wait to see. But that’s about all I knew coming into this book; recognized names but not a lot of work to base an opinion on. Well, dammit, I’m converted. I can’t wait to see where this thing is going. It’s fast moving, has a clever high concept, and roots itself in history. I’m not sure I have better praise for an espionage thriller. The writing is snappy and the dialogue is well done. Every character has a unique voice and I could, even after one reading, tell you who said what just based on the line. With a couple of them strung together, I could have given you a character sketch. The cops sound like good cops, but they get totally schooled by the Cold War maven with ice in her veins. The operatives aren’t heavily detailed, but their broad strokes are sketched. I already know who I like and who I don’t. I also have strong suspicions of who I will end up liking. These lists are not the same. That’s good character work. The art is moody and atmospheric. Those are buzz words, so I’ll spell it out. The art is dark with bright colors used in between strong, dark inking. If you’ve ever seen the 90s Batman animated series where they started with black backgrounds and then painted daytime on them when necessary, it feels like that. But the lines aren’t nearly as clean as in animation. They’re scratchy and diffuse. Everyone gets a little fuzzy around the edges and, I bet, that’s actually a mood setter. I suspect nobody will be quite who they say they are or will be doing quite what they think they will as the story progresses. We move from teeming streets, living rooms, and even funerals in Cuba all the way to police interrogation rooms in Washington DC. The backgrounds are detailed and claustrophobic, even on the street scenes. The art brings tension to the story as everything feels close and will likely tighten like a noose by the time the final page is turned. The plot. I should probably say something about the plot. From what I can tell, this is the story of a sleeper cell from Cuba with a mission handed down parent-to-child for fifty years. It’s also the story of the cops who are trying to stop them from a successful mission. I’m not sure what the mission is yet, but I can tell you that the last page reveals that it is big. The last page is a great cliffhanger and slap in the face. Pigs is in fine comic book stores everywhere on September 14. For anybody who thinks the warriors have come in from the Cold War, this book promises to knock their socks off. Highly recommended. This month I’ve got a choice bit of comic book literature that should be near and dear to people who spend a lot of time thinking about their fiction, be that the fiction they write, the fiction they love, or both. The Unwritten is a story about stories, about the power that stories have, the power that belief gives, and what happens when the power of story and belief is harnessed and twisted by evil men. First the pleasantries. The Unwritten has script, story, and art by Mike Carey and Peter Gross with a whole bunch of people on finishes and colors, Todd Klein is the letterer, and Yuko Shimizu on original covers. The story follows Tom Taylor, a grown man living not only in the shadow of his father, Wilson Taylor, missing these last ten years, but also of his fictional self. Tom’s father wrote a series of books about a young boy named Tommy Taylor who discovers he’s a wizard (the Harry Potter comparisons are on purpose and actually messed around with in the fiction itself) and has all kinds of misadventures. The books are an absolute sensation for years and years and have become cultural bedrock. Tom has been living a fairly comfortable if hypocritical life sucking the marrow from his father’s fictional works even as he resents them, but at the beginning of the story this starts falling apart. He’s accused of not actually being the child of Wilson Taylor but, instead, the kidnapped child of Gypsies raised by Taylor and his mistress. He’s suddenly a suspect in his father’s disappearance despite the fact that he was just a child at the time. The tide of public opinion turns against him as he’s considered a tarnish on the joy of Tommy Taylor. The final straw comes when Tom is framed for several grisly murders by a shadowy organization and is arrested then extradited to France for trial. All that would be bad enough except that he’s also having visions of fictional characters interacting with the real world and a girl named Lizzie Hexam, a name taken from a Dickens character, insists all kinds of crazy things about Tom, his father, and the messianic plans Wilson had for his son. The sinister cabal behind framing Tom has been manipulating human history for a very, very long time by choosing which stories are told and which are suppressed. Wilson Taylor discovered the existence of this group and declared quiet war against them. He built up the incredible cult of belief around his son via his books to “weaponize” Tom’s fictional status. Naturally, Tom doesn’t believe a lot of this and tries to ignore it even as it ruins his life. This is a great story so far and one that left me hungry for more when I finished the third volume (the last until October). I spend a lot of time thinking about fiction and literature working as myths and how belief gives them power, so this was an easy sale for me. Still, we all know of instances in history–Hitler and Stalin come to mind–where stories were manipulated to sway the opinion of entire countries even in the face of facts. Taking that idea and making it larger than life with a secret society manipulating history on a grand scale is both clever, fascinating, and just grounded in reality enough to be terrifying. The story works on a thriller level as well since Tom finds himself on the run with a mission he doesn’t really believe in through locations both real and fictional but all deadly dangerous. The art is very attractive and goes a long way to helping get the personalities of the characters across. Tom is drawn petulant and whining, Lizzie is drawn wide-eyed and innocent, the head of the cabal is drawn smarmy and condescending. The covers are fairy tale like and have an ethereal beauty that is also weird and slightly off-putting as only fairy tales seen with adult eyes can be. The only downside is also the reason I’m reviewing three volumes rather than one. The story is very slow to get started, though it isn’t a slow read by any means. It’s very engaging and interesting, but it is a while before you glimpse the edges of the “real plot.” After the first volume I found myself wishing it was a novel so that the story could move along more briskly. By the time I finished the third volume, however, I was eyes deep in the plot and wouldn’t have traded it for anything. After all, a novel couldn’t have told a mysterious character’s background in the form of an illustrated choose-your-own-adventure where the reader makes the decisions. How brilliant is that? 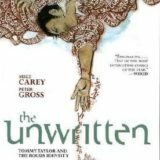 I recommend The Unwritten highly and hope that anybody who picks it up and reads it will email me so we can have some interesting and serious conversations about the groundbreaking work Carey and Gross are doing on this book. Having completely blown my deadline last week due to extenuating circumstances that included my son’s birthday party and having my guts kicked out I decided to do penance by taking on a monumental task. As an added bonus to this herculean undertaking, I invite you faithful readers to read one of the greatest pieces of neo-noir literature ever crafted. Today I review 100 Bullets. I’ve been on a bit of a fantasy kick lately, which is a tremendous anomaly for me. Some years ago I stopped reading fantasy that I hadn’t already read because most of it was overblown, overlong world building rather than character or story building. Rereading Patrick Rothfuss’s The Name of the Wind in preparation for reading its sequel, Wise Man’s Fear, has reminded me that fantasy worth reading is a thing that can exist.